Garden Pictures from the Seattle area! They say a picture is worth a thousand words, something that I take to heart! 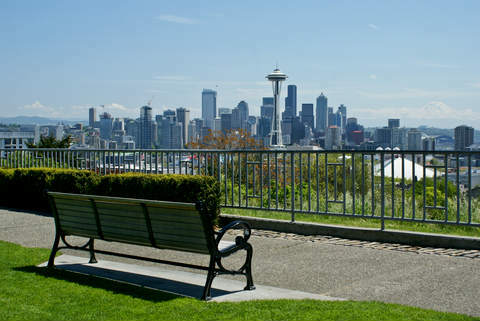 I live near Seattle, Washington, in the USA, and in many ways, Washington State is a gardener's paradise! Consequently, there are some incredible examples of good garden design in my area! There is no end to the ingenuity of residential gardeners who have grasped the basics of garden design. I love to wander and see what local homeowners have done with their gardens. ﻿Garden pictures can be great sources of landscape design ideas. Especially when they are done by residential home owners! If someone else did them at home, you probably can too! I'll be highlighting great garden ideas, unusual garden treatments, and strong solutions to problematic design dilemmas often faced by homeowners. I hope these garden pictures will become a great source of ideas for your own gardens! ﻿Look at the wonderful color mix and unusually treated balance of this wonderful garden border! The picture does not do this justice….this is a most amazing garden bed treated with shrubs and garden annuals. Here is a wonderful example that demonstrates the excellent use of color. The varying blue tones of the hydrangeas and annual selections perfectly set off the bold blue color of the house, while extensive use of white petunia and geranium accent the composition and provide a repeated counterpoint to the larger field of blue and green colors. In addition, the complementary color choices represented through the red and purple tones of the roses, geranium and petunia selections add an additional punch to the scene. The effect is marvelous, and is truly traffic stopping. Learn more about color principles by visiting the page on color values. There is a second lesson in garden design so beautifully demonstrated in this homeowner's garden bed. One of my most popular pages addresses asymmetrical balance. This garden is a beautiful example of asymmetrical balance in action. Note that the home has a second story over the garage to the left. 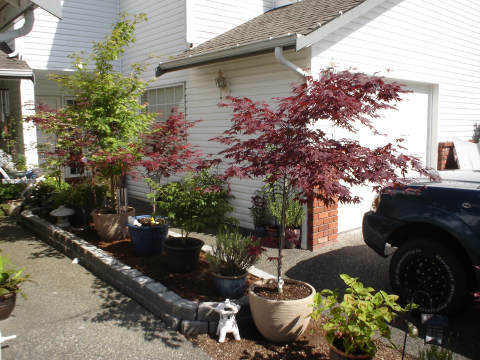 This homeowner recognized and exploited that fact by choosing a variety of larger shrubs at that end of the home. The asymmetrical theme is further reinforced by the use of gradually shorter plant varieties across the front of the bed. This one element of the garden border integrates the garden with the home, and thus creates a beautiful whole. 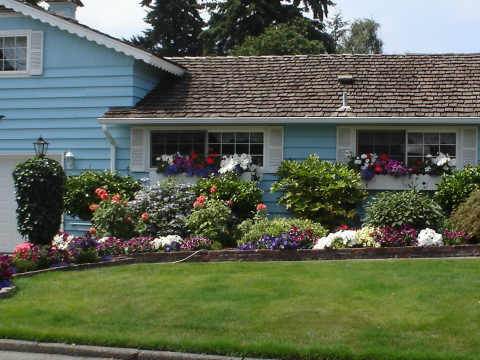 The natural tendency of most homeowners is to plant similar height plants across the back all across the home, and fill in lower plantings below. By resisting that tendency, this homeowner crossed the line from beautiful to knockout gorgeous. Learn more about planning your garden border! A third, much more subtle element is seen in this composition. Note that there are three evergreen shrubs placed across the back of the beds. These three shrubs are not equally spaced. This homeowner planted the shrubs using the "golden ratio". For more about the golden mean and how it amps up our perceptions of beauty, see the rules of composition page. Here is a solid, newly planted garden design! A great example of Visual Texture in action. Color abounds in this garden, present in foliage and in flowers. But it doesn't stop there! This homeowner understood the use of textural elements in the garden. 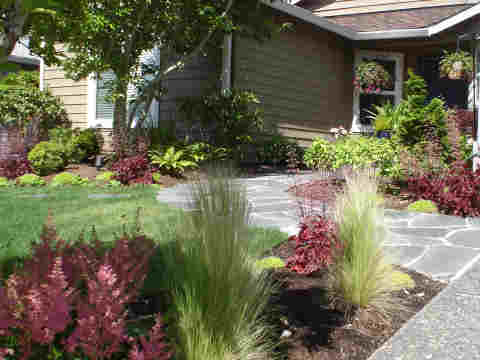 Ferns, Astilbe, Mexican Feather Grass and Coral Bells all add a visual interest unusual in most residential designs. Visual texture is achieved by varying the heights of plantings and the use of hanging baskets and a container near the porch. Adding to the visual experience is a beautiful flagstone walkway. I love the way that this homeowner has used these elements to create a sharp, interesting composition. As this garden matures, it will remain wholly textural and beautifully composed, as the permanent elements of the garden and the maturing plantings will meld together to create a tapestry of quiet beauty. Ever wonder what to do with that long, extremely narrow strip between your driveway and the neighbors? Garden spaces such as this can be problematic to design. This is a situation where less is much, much more for the average homeowner. Check out this homeowners solution for managing a difficult space! Limiting the design palette to a very few, extra special plants such as these Japanese maple varieties gives this small garden plot a unity and appeal that is unusual in these small spaces. The delicate leaves and varied height of the maples adds a visual texture and variety to the space, and the contrasting colors of the foliage creates a strong counterpoint that draws your eye. The best part? This homeowner lives just a few doors down from me! I get to see this almost every day and enjoy their creativity!